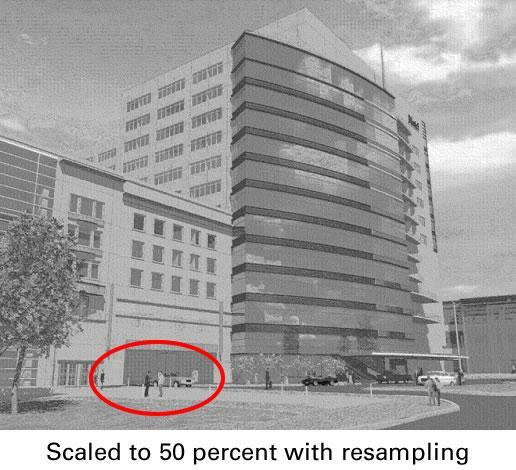 The resampling feature is applicable to monochrome (black and white) TIFF images when printing or converting (Output to File) at scale factors other than 100 percent. 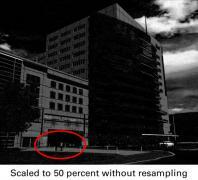 Resampling while scaling has a dramatic and favorable impact on image quality. Halftones are preserved, as are small details and text. 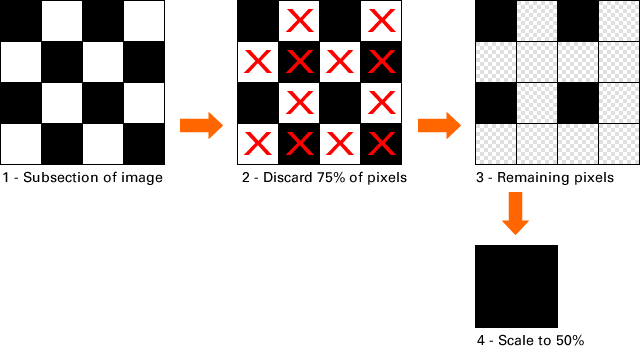 The resampling ﻿feature will mitigate many of artifacts that are typically introduced when scaling a monochrome TIFF image. The examples below are typical. The first image is the full-size original. The second is a half-size produced without resampling. The last image is a half-size produced with resampling enabled. Click on any of the images for an enlarged view. Notice that the highlighted detail (two people with an automobile in the background) is almost completely illegible without resampling. 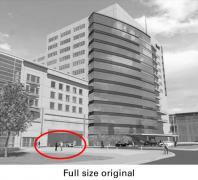 With many wide-format systems there isn't much intelligence applied when scaling monochrome TIFF images. Let's say that we want to produce a half-size of a 36 inch x 24 inch original. The resulting image will be 18 inches x 12 inches. This is a 75 percent reduction in area. Or, to look at it another way, three out of every four pixels must be discarded. 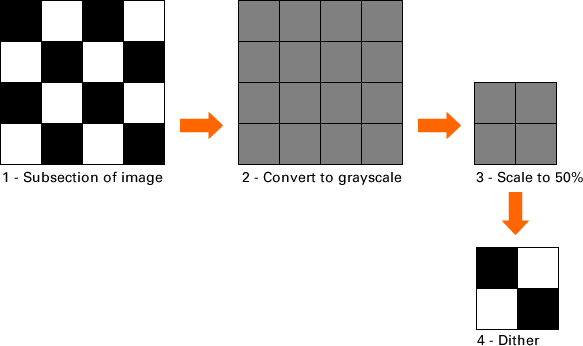 In the example below, without resampling, the 4x4 pixel subsection is a 50 percent halftone at full-size, but when scaled to 50 percent the resulting subsection is solid black. 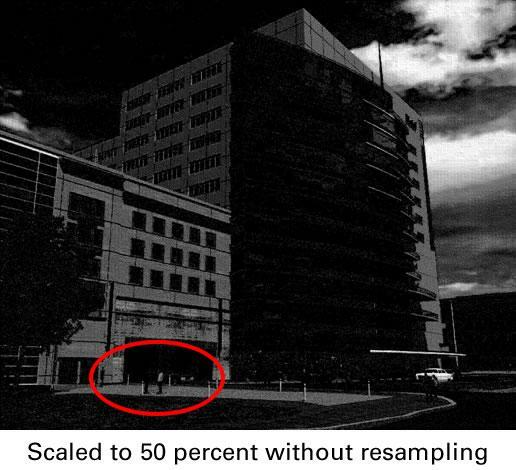 Resampling adds intelligence to the scaling process. In the example below, the 4x4 pixel subsection is sampled and then converted to its grayscale equivalent. In this case, the 50 percent halftone is converted to a 50 percent grayscale value (RGB 127, 127, 127). Each small subsection is converted to its grayscale equivalent, the entire image is scaled, and then the entire image is dithered if printing to a monochrome device. 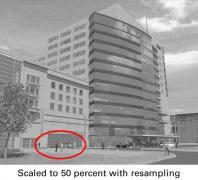 The 50 percent halftone in the original is replicated at half-size.